As it gets warmer in the desert, we start thinking of meals that are chilled or, at the very least, room temperature. When the mercury hits 100°f (38°C), even I don't feel like cranking up the stove. I must admit, though, that on the weekend, I have been known to crank the solar-powered air-conditioning so that I can cook some good, old-fashioned comfort food in, well, comfort! When the weather is hot, I like to make part of our dinner in the morning before work when it's coolest to avoid heating up the kitchen when we’ll be spending time at home in the evening. We have a very open house. The kitchen is open into the dining and living areas, and the heat from the stove and oven travels fast. I love having the open floor plan; it makes for very comfortable and effortless entertaining. I never actually have to leave the party when I go to the kitchen to finish up. But I don’t want to make everyone hot when cooking on a summer night. Today's recipe is a perfect summer entertaining recipe adapted from Noodles, a cookbook I posted about a couple of months ago. It was a gift from my friends Philip and Patricia, and has been a wonderful addition to my library. Just because the weather is hot, it doesn't mean that I don't want to cook or entertain. But it does mean that I approach it differently. 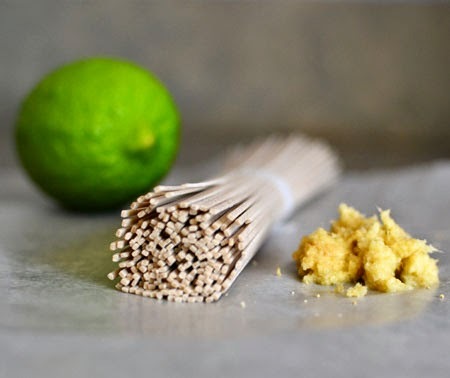 Combine the lime juice, ginger, sesame oil, and mirin on a bowl and whisk well. Set aside. Peel the cucumber and discard skins. 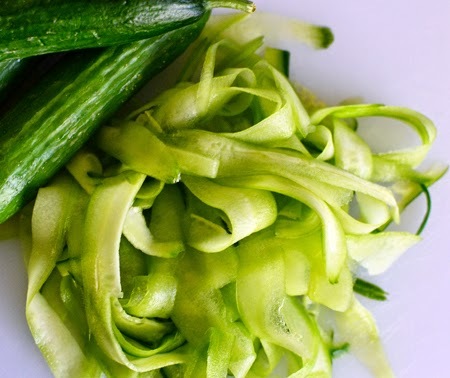 Using the peeler, make lengthwise peels while turning the cucumber, in effect, making wide cucumber noodles. When you get to the seeds, stop peeling. 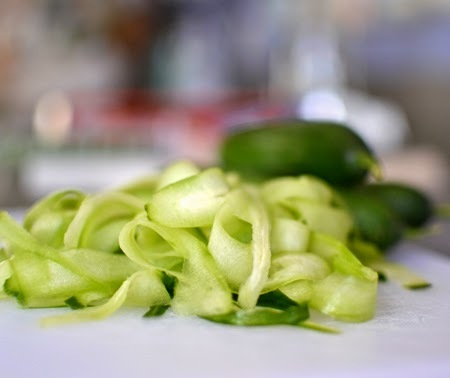 Discard the seeds, and set cucumber noodles aside. Bring a large pot of water to a boil. Salt lightly. 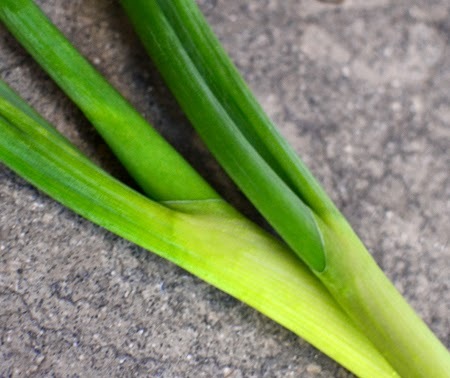 Blanch the scallions for 30 seconds to 1 minute. 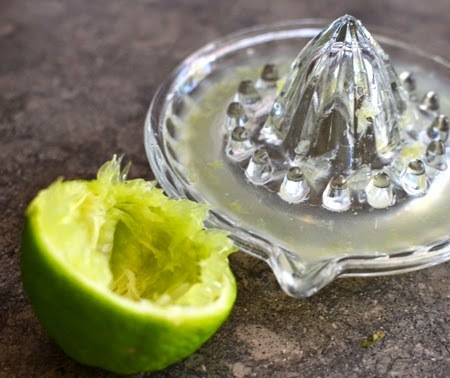 Remove from water with a mesh strainer and set aside to cool. Cook noodles as directed on the package in the same water. Drain and allow to cool. In a bowl, combine cooled noodles, reserved cucumber noodles, blanched scallions. flaked salmon, and cilantro leaves. Add dressing and toss gently. 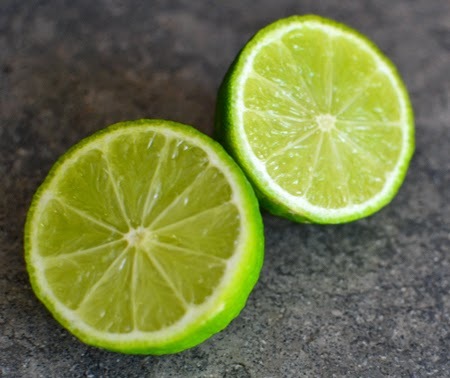 Divide among 4 chilled plates, and serve with lime wedges. As I sit here typing with cold and numb fingers and gorgeous fluffy slippers on my feet, 38°C sounds a little attractive. Perhaps for a couple of minutes, anyway. I love soba noodles. 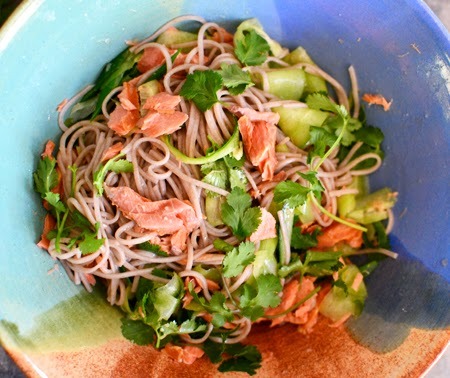 I think next time I smoke a piece of fish I may have to make this noodle dish. Sorry it is so cold there, but we all know it's coming. Actually, yesterday hit 41°C (106°F) - but we are pretty used to it by now. John, I think I need to start smoking my own fish (as well as poultry and meats). David, like John said, it's freezing in Australia right now and you salad sounds exquisite! Would you mind if I made it myself and blogged it, with credit back to you, of course? Liz - of course you can! I am honored. I remember the first time I read one of your posts - it was a shrimp salad, and when I was making this, I actually thought of that shrimp salad and you! PS I have the book, I should take a look at it! I have actually made several recipes in this book and like them a lot. Since Mark loves noodle dishes, this is a great resource for me. This looks wonderful - such clean and refreshing ingredients. Perfectly delicious in its simplicity. Thanks, Padaek! The simplicity really makes this salad. Love all of those ingredients! A perfect summer salad! Thanks, Mimi - and so glad you stopped by Cocoa & Lavender! I love this recipe - how perfect for a night in on a warm evening. The second image is so beautifully photographed. Frameable. Thanks, Valentina! I am so pleased you like the second photo. It was a last minute choice and I am glad I used it. As we are having a lot of warm nights, this might be dinner several times in the next few months! 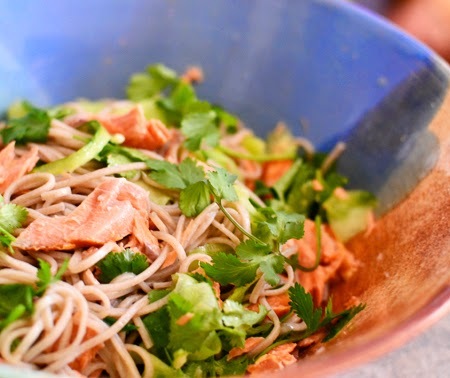 Hi David, this salad is right up my alley, soba noodles are my favorite and salmon is my all time favorite fish. Looking forward to your ginger coconut ice cream recipe. Summers in New Bern NC are pretty hot, too, and we have the humidity. This dish will be a great one to add to my list of summer survival recipes. I don't envy you the humidity, Penny! I like it nice and dry... But, you have such good seafood there - this should be an easy treat! I have bookmarked this recipe for when the weather gets a bit warmer here :) I am looking forward to the recipe for the ginger and coconut ice cream that sounds right up my street..now I have to ask myself is it ever to cold to eat ice cream? Karen, the answer is definitely no. I have eaten ice cream at -12 degrees C with a beanie and woollen gloves on... and the benefit is that not one drop melts from your cone! Ice cream lovers unite! This is such a perfect, light and delicious salad David! 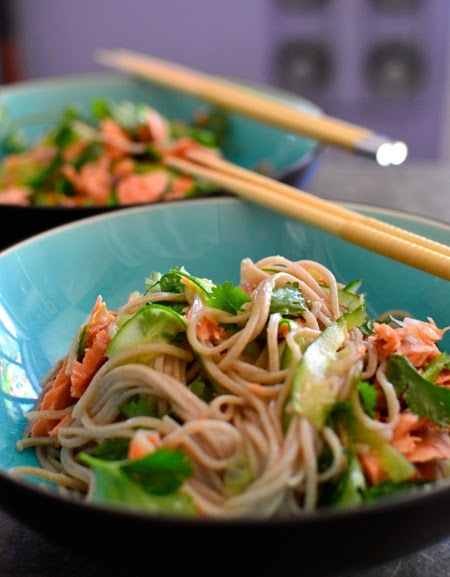 I adore soba noodles, they're such a great resilient vehicle for salad dressings and strong flavours. 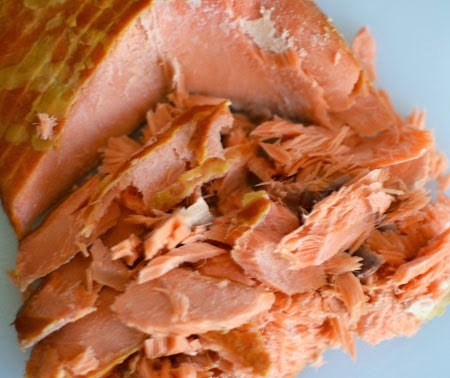 That hot-smoked salmon looks AMAZING. Aaron would drool if he saw this post... it's one of his very favourite things (but alas, he is at home and I am at work, getting very hungry at my desk!). I'm glad that you're surviving the hot weather... we're freezing over here! Maybe you should share it with Aaron, Laura! I personally think the hot weather is easier to manage than the cold weather - at least the trees aren't bare and there are lots of flowers blooming! Stay warm and keep sending good recipes! 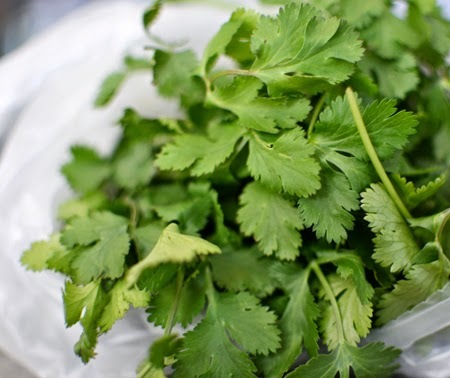 Dear David, recipes like this are invaluable to have on hand, particularly if entertaining and just because if it is too hot for cooking during the day - I love the freshness of all the ingredients that you used, the salad sounds divine! Period. Thanks, Andrea! Fresh and light is the key for summer! Thanks, Robin - and thanks for stopping by! What a great salad…looks hearty and full of flavor! I love soba noodles! 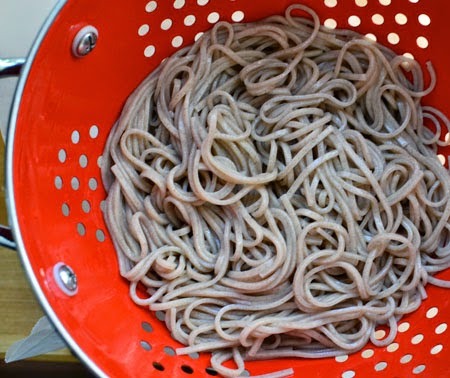 Kathy - everybody seems to love soba noodles - I wonder why we don't use them more! Have a great 4th! D, that salmon looks awesome. Shawn usually smokes it for us at home and we freeze what's left, which usually isn't much. He would love this dish. I have to make it tonight. Uncanny, this is not the first time this has happened. Just made a cold soba noodle salad last night for the first time and was getting ready to post about it and decided to catch up on my reading after a week away... and ta daa! You made it too (before me might I add). I love your version, I will be trying it for sure. That is really amazing, Fiona! It is nice that great stomachs think alike! Glad you are back and look forward to your posts! Beautiful combination of summery flavors and textures. A perfect treat for warmer days. I have only been to Palm Springs once, and never had the opportunity to shop. I guess opportunity is the wrong word, eh? I am thinking you might have trouble with the soba noodles. Maybe you could buy them from a Japanese restaurant!